Liposomes and supported lipid bilayers (SLBs) are having an increasing impact in designing new biomedical approaches owing to their cell-like structures and native biophysical environment. 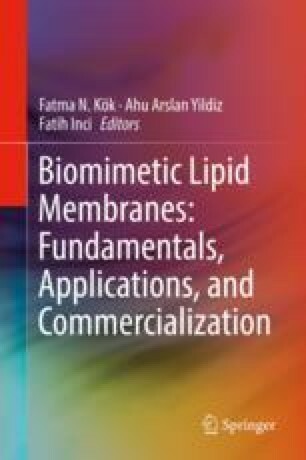 In particular, as membrane proteins are target of 60–70% of pharmaceutical drugs in the research and industry, liposomes and SLBs denote unique and versatile capabilities in membrane protein research compared to the conventional systems, which have significant challenges in handling membrane proteins without denaturation and loss of function. Besides, the integrations of liposomes and SLBs into micro- and nano-array format open new avenues to create biochip strategies for modern clinical use. In this chapter, we extensively review biomedical applications of liposomes and SLBs through (i) sensing strategy for diagnostics and (ii) theranostics and labelling capability for imaging, (iii) carrier roles for vaccines, and (iv) tissue engineering approaches for multiple cellular processes. Integrated strategies such as lithography and array formation will be also discussed here in order to envision the potential applications of liposomes and SLBs in the near future.